The small town in the Saratov region was swept by massive rallies after a local resident was stabbed to death by a Chechen teenager. Angry citizens headed for the neighborhood where a Chechen diaspora had settled over the past ten years. The city of Pugachev in the Saratov Region has been swept by a wave of spontaneous rallies. The small district town with a population of just 50,000 has become the talk of the whole of Russia ever since its people, unhappy about the local government’s ethnic and social policies, blocked the federal road linking Volgograd and Saratov with Samara twice. The town, named after the Cossack Yemelyan Pugachev, grabbed the headlines on the night of July 7, when about one hundred angry local citizens headed for the neighbourhood where a Chechen diaspora had settled over the past ten years. According to the press service of the Ministry of Internal Affairs in Saratov, the majority of the crowd was shouting anti-Chechen slogans. Most of them were relatives of murdered 20-year-old Ruslan Marzhanov, who had recently been demobilized from the Airborne Forces. The head of the Pugachev investigative department of the Investigative Committee Pavel Kos reported that on the day before his murder the young paratrooper had quarrelled with 16-year-old Chechen Ali Nazirov, in town visiting his relatives. During the scuffle, which took place near the popular cafe Zolotaya Bochka (Golden Barrel), the Chechen stabbed his opponent with a scalpel several times. The victim, a native of Pugachev, died soon after. Although the Chechen youth, who had tried to escape, was promptly apprehended by the police, the incident caused popular outrage. The town has seen similar tragedies before. A brutal murder was committed in very similar circumstances in 2010. Twenty four-year-old Chechen Beslan Mudayev fatally stabbed twenty eight-year-old Nikolai Veshnyakov five times during a fight that broke out right in front of Zolotaya Bochka. Locals claim that the Chechen community, consisting of a dozen families in total, has been harassing the local population. According to official statistics, there are about 80 Chechens living in various parts of the Pugachev District. Since the early 1990s, people from the troubled republics of the North Caucasus have been moving to big Russian cities, but in recent years they have also started settling in provincial centres and large villages. Until recently, there had been no open conflicts between the settlers from the Caucasus and the people in the Saratov Region, probably also because the territory has traditionally been inhabited by many ethnic groups, including Muslim Tatars and Bashkirs, and some native Kazakhs - all coexisting fairly peacefully. The trouble in Pugachev reached its peak on June 8, when rumours began to circulate that Nazirov had been released from custody. Another theory going around was that the Chechen teenager’s elder brother was complicit in the murder. Reacting to the news heard through the grapevine, about 600 people took to the main streets of the district centre demanding that all Chechens be expelled from the town. The head of the district administration Stanislav Sidorov addressed the rally promising to look into how people from the Caucasus complied with immigration laws, but the protesters were not content with the promise. According to the deputy governor of the Saratov Region Denis Fadeyev, ethnic clashes were prevented only because tens of young Chechens had by that time left town on the orders of the Chechen elders. But that did not stop the protesters, who after the end of the working day blocked the road linking Saratov to Volgograd and Samara. It took Saratov Region Ministry of Internal Affairs head Sergei Arenin about 40 minutes to calm the crowd down and persuade them to move to the House of Culture. They were met there by Saratov Governor Valery Radayev, who talked to the angry citizens until midnight promising that law enforcers would look into the circumstances of the incident. Tuesday morning went by quietly. The streets were almost deserted, save for reinforced police crews and the odd passer-by. But that was not the end of the unrest. Fears of a second wave of protests began at 4 pm. The speaker of the Saratov Region parliament Vladimir Kapkayev and governor Stanislav Sidorov spent an hour and a half conferring behind closed doors. The administration’s press service reported that a new rally was allegedly being prepared. At 5.50 pm, two big buses delivered policemen armed with rubber batons to Pugachev’ Sobornaya Square, which they then sealed off. The stand-off in the square lasted almost an hour, whereupon the swelling crowd headed for the town hall demanding an audience with the authorities. 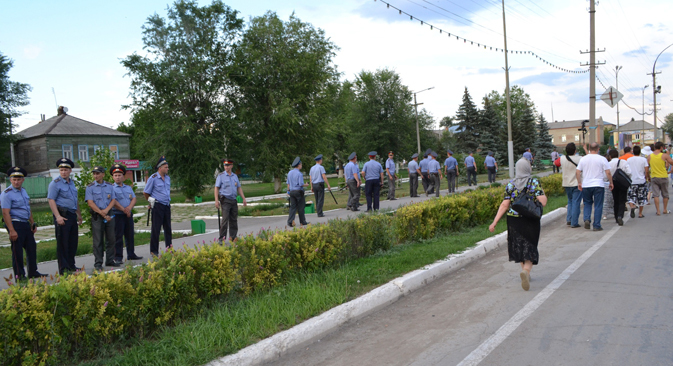 No local official came out, so the protesters headed along the already familiar route towards the federal highway leading to Samara. Police had formed a ‘human shield’ on the approaches to the highway, but the angry citizens, some of whom were intoxicated by alcohol, managed to force their way through the cordon and blocked the road. The police tried to block the crowd twice more, succeeding only on their last try. The crowd presented the police with an ultimatum: it had five minutes to bring district or regional officials to the scene, or they would attack once again. Fadeyev arrived on the scene but was prevented from talking with the people by heavy rain. It was not until 10pm that he convinced the protesters to send women and children back to town. A little later, he persuaded those who remained on the highway to go to the local House of Culture and negotiate there. The talks lasted into the small hours, but failed to resolve the stalemate. People still say they mistrust the local authorities, while the regional government threatens to use the police to prevent violations of the law. There are rumours that provocateurs from the National Bolshevik Party, officially banned as extremists, are on their way to town. Law enforcement bodies are on high alert, especially after new attempts to block the local railway station were reported on Wednesday. Meanwhile, the authorities are taking a series of steps aimed at containing the emergency. A moratorium on the sale of alcohol has been enforced and is due to last until July 19. The head of the police Igor Lopatkin has been fired and Presidential Plenipotentiary Envoy Mikhail Babich has been sent to town to advice on the best course of action.